I have a dilemma—a New Year’s dilemma. 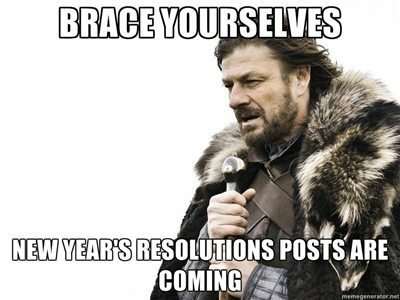 At a time when resolutions dominate the season, resolutions are the one thing I dread. Every January, I make resolutions: Eat better; exercise more; save money. But if history is any indicator, I know that my grand declarations of self-betterment will likely fall to the wayside come February. Sound familiar to you? Great! Then you’re the person I want to chat with. This year, the iFixit team has launched the repair pledge. Thousands across the globe have already taken the pledge. And they’ve committed to foster repair education, combat throw away culture, and stand up for our right to repair. Now, if adding another resolution to your list sounds a bit daunting—that’s alright. I expected that. Diving into a repair can be daunting if you don’t know where to start. So I’m going to help you out. I’ve put together a list of 5 easy repairs to help you keep your repair resolution. I picked repairs that should take you less than an hour, will save you tons of money, and extend the lifespan of your things. Perhaps these will be the only repairs you do all year—perhaps they’ll be a gateway into more complicated, epic repairs. Regardless, I took the pledge—and with that I happily agreed to share what I’ve learned. 1. Repair an iPhone. How many of your friends and family are walking around with cracked screens? iPhones are well-loved objects—that are prone to serious breakage. But that’s okay. Rescue it with just a couple of tools and parts. Admittedly, some iPhone repairs can be hard (be sure to look at the difficultly ratings on our repair guides). But other iPhone repairs, like swapping out the cracked back panel of an iPhone 4 and an iPhone 4s, are surprisingly easy. A little confidence, and you’ll be back on iPhone easy street again. 2. Revitalize a MacBook Pro. New MacBook Pros are expensive—like, vacation-to-Bali expensive. And most people will bite the $2,000 bullet. But instead of going for an expensive replacement, just give that older laptop some TLC. Do something awesome: give new life and speed to that MacBook Pro, and just upgrade the RAM. If you’re new to the world of computer tinkering, this is the ideal place for you to start. Swapping out your RAM takes a screwdriver and maybe five minutes of your time. 3. Salvage with sugru. Got a lot of little things that need improvement? Go around the house and fix all of the small snaps and cracks that plague you with sugru. This self-setting rubber can fix any worn gadget or gear. So grab a packet of this miracle material and repair everything from damaged cables to broken toys! 4. Sew rips, tears, or snags. Garments are personal. We all have our favorite button-downs, puffy jackets, or oh-so perfect-fitting slacks. But sometimes those worn pieces need a new zipper or a mend on a torn seam. Don’t throw away your favorite jacket—just grab a needle and mend it. 5. Overhaul your bike. Is your cruiser bike, mountain bike, or road bike giving you trouble? Not to worry. Replacing that bike tube or reassembling that chain will be easy … easy as riding a bike. Know of any other easy repairs that might help some new fixers out with their Repair Resolutions? Tell us about them in the comments. Another easy one, game consoles or Blu-Ray/DVD players that fail to read discs. Usually it’s a dirty laser lens which is easy fix. Even if it’s a bad laser eye, a common problem on Nintendo Wii’s, it’s not a difficult repair. it is the way to repair the device of the MacBook or iPhone which had the default from inside so it can help to furnish the product which will be very initiative if you’re able to repair the product. I just came across this site and it is wonderful. The throw away society contributing to pollution of all kind. I think it is great and I see so many ways it could expand. Thank you!